An Englishman in Colombia: Disaster! I knew it was a gamble, but true to form, we didn't just have gentle rain last night, we had a full blown tropical storm, and when I went out this morning, I was greeted with this. Thank goodness I had tied the concrete blocks to the balustrade, and we were lucky that the central rope gave under the weight, otherwise those terracotta pots would have smashed to the bottom of the pool. 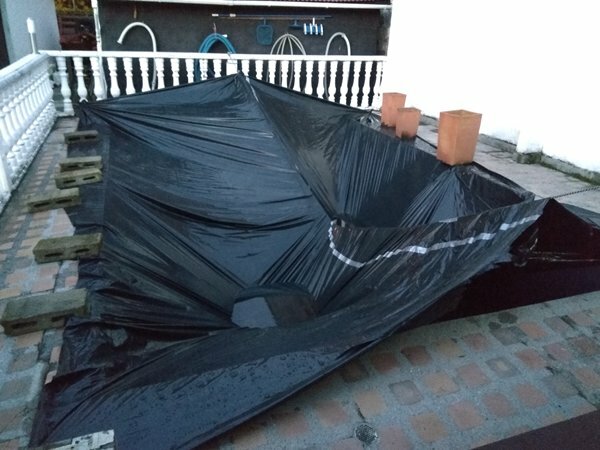 It had to be sorted before the sun came out, otherwise the plastic would have torn and all the water gone back into the pool, Marcela was woken from her dreamy sleep, and when I informed her what has happened she jumped out of bed to give me a hand. We pumped the water out of the two 'ponds' that had formed, and then removed the plastic and all the ballast we had installed. We will just have to grin and bear it, mopping when required. Having salvaged what we could, I took the boys for their delayed walk, after which Marcela suggested that we hop in the car and go down to Copacabana and buy Fiambres for lunch, it sounded like a good idea, especially as it was still early, but they had sold out, so we had to make do with Tomales . Back home, I decided to try out my new multi-tool on grout removal. but first, I went around the pool marking those tiles that will need replacing with a big red 'X', a few of which you can see here. 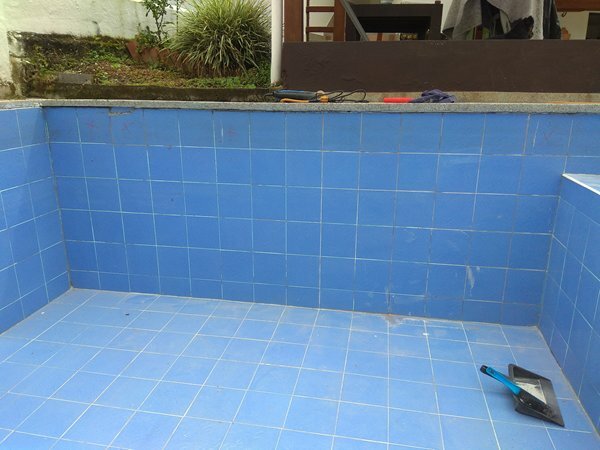 I started grout removal just to the left of the steps, and soon found what could well be another big problem once everything starts drying out, the nearer to the bottom of the pool I was, water started coming out of the grout lines, once dry the tiles could well come away from the wall, this is turning into a nightmare. However I think that whatever collapses, we have decided to finish the renovation of the pool, and then I am going to build a roof over the top, and we will use the pool as the gymnasium, or use the pool as the social area, and the existing gazebo as the gym, not sure yet, but what ever, this is going to be a long term project, with a lot of mopping, especially when winter arrives again! The multi-tool works, but is not as quick as I thought it would, so I am also using the hand grout remover. I did about 2 m2 this morning, I had to keep stopping as the machine was overheating, I soon got into a rhythm, a patch with the machine, then a bit with the hand remover, whilst the machine cooled. It was then time for a shower as the sun was out, and it was too hot to work in direct sun, although now at 12.20pm, it is brewing for another storm! No more work today...it is Sunday after all.